I saw my friend Brad Stone who is the Silicon Valley correspondant for Newsweek at last week's Maker Faire. He recently wrote a Wired Magazine article about Mecha type robots that I liked, so I keep my eyes open for this type of technology. Atsuo Takanishi demonstrated his latest 'walking wheelchair' at Waseda University in Tokyo.The leg-chair was developed at Waseda University's Humanoid Robotics Institute with Tmsuk robot researchers. A human rides in a chair set on top of the robot legs about four feet up. With its ability to climb stairs it could render wheelchairs totally obsolete. 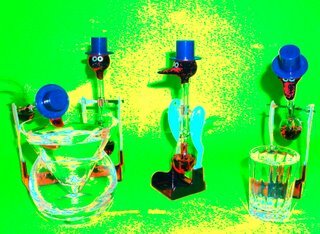 I wrote in an earlier post about the high number of out-of-box failures I had experienced with my purchase of 6 Dippy Birds from Edmund Scientific. At the time, three of the six birds refused to dip. Well, now that the air temperature in my office has risen a bit, all of the birds are working. Obviously, dippy birds like warm weather. So, there you have it. I want to recognize publicly the one bird that worked in the lower room temps. He deserves special praise. I've given him the name Al. Al, you're tops. JCB is aiming to set a new land speed record for diesel vehicles with a super sleek streamliner car to be driven by Wing Commander Andy Green, the fastest man on Earth. The record attempt will take place on the famous Bonneville Salt Flats in Utah during August 2006. Powering the stunning, nine metre long JCB DIESELMAX car are two JCB444 diesel engines, developed to produce 750bhp each. There are lots of different catagories of records for land speed racing. There are records for electric vehicles, turbine vehicles, blown lakesters, unblown fuel streamliners and so on. The fastest vehicle I see in the the Southern California Timing Association's record book for Bonneville is a blown fuel streamliner driven by Tom Burkland that reached 417 mph. That's fast. Anything faster has a turbine or a rocket behind it. 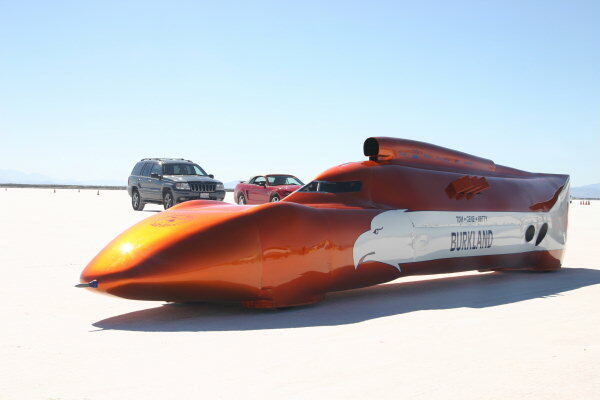 The current record for a diesel powered vehicle is getting old - it dates back to 1973, when Virgil W. Snyder achieved 236 mph in the Thermo King Streamliner. In fact, this is by far the oldest record in the SCTA record book . If Dieselmax is successful, then the oldest record will belong to the Steamin Deacon, top racer in the rather esoteric "steam powered" catagory that reached 145 mph in 1985. Scott Crossfield, the first man to fly at twice the speed of sound, routinely climbed into some of the most powerful, dangerous and complex aircraft of his time. This week, the 84-year-old Crossfield was piloting a single-engine Cessna 210A when it dropped off radar screens on a flight from Alabama to Virginia. His body was found in wreckage Thursday in the mountains about 50 miles northwest of Atlanta, authorities said. On Nov. 20, 1953, (Crossfield) became the first man to fly at twice the speed of sound as he piloted the Skyrocket to a speed of 1,291 mph (Mach 2.005). With 99 flights in the rocket-powered X-1 and D-558-II, he had — by a wide margin — more experience with rocketplanes than any other pilot in the world by the time he left Edwards to join North American Aviation in 1955. As North American's chief engineering test pilot, he played a major role in the design and development of the X-15 and its systems. On June 8, 1959, he completed the airplane's first flight, an unpowered glide from 37,550 feet. On Sept. 17, 1959, he completed the first powered flight. Shortly after launch on his third flight, one of these engines exploded. Crossfield was forced to make an emergency landing during which the excessive load on the aircraft broke its back just behind the cockpit. He was uninjured and the airplane was repaired. He went on to complete 16 captive carry (mated to the B-52 launch aircraft), one glide and 13 powered flights in the X-15. On Dec. 6, 1960, he brought North American's demonstration program to a successful conclusion as he completed his final flight in the X-15. How fast did Crossfield go versus other test pilots? Here's a good listing I found with top airplane speeds. According to this list, Crossfield is at the top, if he piloted the X-15 to Mach 6.72 (that's incredibly fast!) The X-43 is the new NASA scramjet. All of these are pretty darn fast. It's funny that except for the X-43, the other very fast planes are designs of the 1950s and 1960s. But, Maker Faire was such a great event, I am excited to blog about it as soon as possible. I saw several people and machines I haven's seen for a while including John Dyer and his Tesla Coil, Lucy Hosking and her Pulse Jet car, Simon Quellen Field, (author of Gonzo Gizmos), Matt Heckert (a founder of Survival Research Labs), Make Magazine's wonderful Mr. Jalopy, Phillip Torrone, Bob Parks, and a bunch of others. Now, I'm sure that there are much better accounts elsewhere of the overall sweep of the event, and they'll likely have photos, so I'll leave those accounts to them. Pictures available here. Dale Dougherty, the publisher of Make and the creator of the Maker Fair concept told me that that beat attendence projections substantially. I think that people overwhelmingly found the event to be fun and entertaining. As this was the inaugural event, there's bound to be some tightening and tweaking needed. My personal experience in leading a workshop, is that it's much harder to do than you might think. My first workshop, was, well, kinda crappy, the second got better, the third better still. You learn as you go. Has anyone ever experienced flop sweat? When perspiration beads up on your forehead when you're giving a demonstration that doesn't go right? I had a couple dozen people watching me try to fire a spud gun but when I turned the igniter, NOTHING HAPPENED. What can you say at that point? Duck's off. Sorry. So I learned that Right Guard Sport does not make a good potato gun propellant. I went back to Aqua-Net. Good old Aqua-Net. Anyway, good to be back home. I'm headed for the San Francisco Bay area tonight to attend Make Magazine's Maker Faire. I am very excited about this, as it has the potential to be a truly wonderful thing. 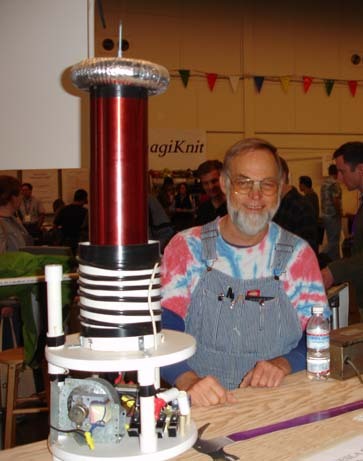 I personally am leading several events including a potato gun workshop, a how-to session on tensegrity tower building, and a presentation on Adventures from the Technology Underground. If you go, please look me up and say hello. This is my picture, so you can recognize me. Bring ants if you've got them. Mmmm, ants. While I don't have the time to check out a lot of new events, in general I'm all for them and hats off to the people at Make for doing this. Think of all the huge, way-too-big events out there now that started small and for the first few years were wonderful, magical even. Burning Man, the Olympics, the SuperBowl halftime show; before they bloated up they were pretty cool. So, I guess the trick is to find something new that looks way cool and enjoy it before it goes stale and bloaty. Worlds First Homebuilt Jet Aircraft? "John Gross has flown into the history books in his homemade jet plane. After seven years building the three-quarter-scale Grumann Panther in his backyard shed, John took to the skies this month at the Kingaroy Aerodrome. "It is Australia's first home-build jet and the first light jet plane built by an individual in the world. It is equipped with an ex-US Navy engine rebuilt by John, who also designed and built the body and installed all navigational equipment, despite having no formal qualifications. " "On Saturday, April 1, John made 3,000ft before taking the plane to 10,000ft on Sunday. "Saturday was pretty exciting stuff and it was breaking new ground as it were so I was flying by instinct," John said. "The jet engine just wants to keep going. I swear I could hear it screaming with joy as it climbed." I wonder if the newspaper reporter's claim as this being the "first light jet plane built by an individual" is true? Seems to me I've heard of other people building jets previously. Mr. Gross chose to use the Grumman Panther jet as his guide. The Grumman Panther is an old model of jet fighter and one with a long history. The F9F Panther was a single-seat, single-engine, carrier-based, jet fighter used by the US Navy and Marine Corps during the Korean War. The Panther joined the fleet in 1949 and that year also became the first jet aircraft flown by the Blue Angels Flight Demonstration Team. These are boom times for those interested in robotic fish. Scientists from around the globe appear to be on the verge of making robotic fish a reality. Why they are doing this, I'm not sure. In summer 1995 the researchers' original creation, patterned after a bluefin tuna, took its maiden swim down the MIT Testing Tank. That swim and others since have been exciting, reinforcing the engineers' belief that the Lycra-sheathed robot could become an important tool toward understanding the physics of swimming and more. The "robotuna" project began in 1993 with the overall goal of developing a better propulsion system for autonomous underwater vehicles. Sure, it looks pretty old fashioned and Captain Nemo-like. But progress marches on. October 7, 2005 (BBC)—This week the London Aquarium unveiled the newest "species" to join its collection: robo-carp. Computer scientists at the University of Essex in the U.K. developed the self-guided robot fish, seen here swimming in the aquarium. The designers say it is the smartest such robot yet created—the fish uses artificial intelligence and built-in sensors to avoid obstacles and respond to environmental changes. The fish's battery lasts for up to five hours, though the scientists hope to one day program it to search for and access a recharging station when it runs low. This is a very pretty looking machine, one of the best looking robots. 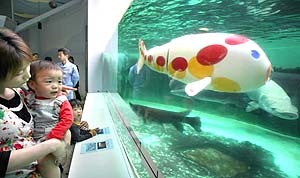 April 14 2006: The robotic koi carp unveiled last month by a group of Hiroshima engineering companies (led by Ryomei Engineering) is scheduled to make its first public appearance this weekend. It was spotted during rehearsal in a large tank at Miyajima Aquarium (in Hatsukaichi city in Hiroshima prefecture), practicing its trademark moves of spinning around, treading water, and swimming in reverse. The robot appeared to be getting along will with the other fish in the tank — an alligator gar and three endangered pirarucu that measure over 2 meters in length. “It looks like a robot, but it behaves like a real fish,” said one surprised onlooker. 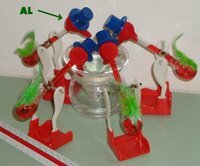 I bought six Dippy Birds from Edmund Scientific for an assignment I'm working on. I can only get three of them to work. That's a 50 percent out of box failure rate. I don't think it's something I'm doing wrong, I mean, it's just a dippy bird. You stick their head in water and they dip. But three of them don't. Beats me. Anyway, the three that do work are a great source of entertaiment. I find myself staring at them and chuckling a lot. They are really goofy looking. Obviously, the question that comes to mind is why hasn't some utility company set up a complex of 400 foot high dippy birds connected to generators to provide a never ending source of clean, reliable dippy bird power? 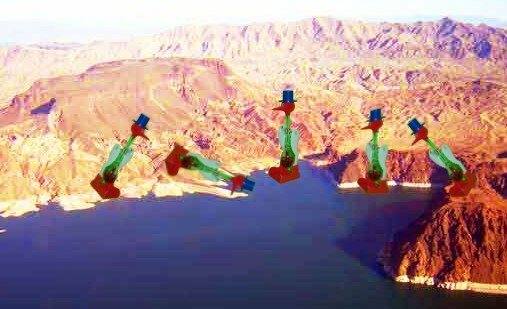 Some arid coastline, say around Lake Mead, would be perfect. I live in Minneapolis, MN which apart from the cold winters is a pretty good place to live. (I think something like 99.5% of the worlds inhabitants live in places with a higher mean temperature than here. Shows how tough we are.) 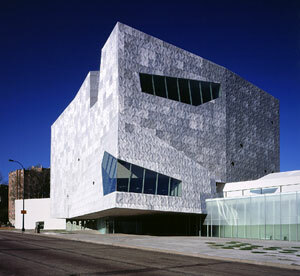 Anyway, Minneapolis' modern art museum, the Walker, recently moved into a new building and I read that attendance figures are flat despite the change. I do not enjoy most modern art. I do enjoy looking at the metamechanics of Jean Tinguely (for short periods of time) and I think a lot of "kinetic art" is pretty interesting. Anyway, I see where you can buy an SKF self aligning ball bearing from New York's MOMA here, for about $180. Now, I've always thought ball bearings are pretty cool, even from a purely esthetic viewpoint, MOMA charges $180 for a 4-inch diameter bearing which exemplifies for me the disconnect between the modern art world and the real world. Before I rant too much, maybe this is some special artistic rendition, but the normal cost of a 4-inch bearing, at say, McMaster Carr is probably around $30. As you raise spoon of soup (A) to your mouth it pulls string (B), thereby jerking ladle (C) which throws cracker (D) past parrot (E). Parrot jumps after cracker and perch (F) tilts, upsetting seeds (G) into pail (H). Extra weight in pail pulls cord (I), which opens and lights automatic cigar lighter (J), setting off sky-rocket (K) which causes sickle (L) to cut string (M) and allow pendulum with attached napkin to swing back and forth thereby wiping off your chin. After the meal, substitute a harmonica for the napkin and you'll be able to entertain the guests with a little music. 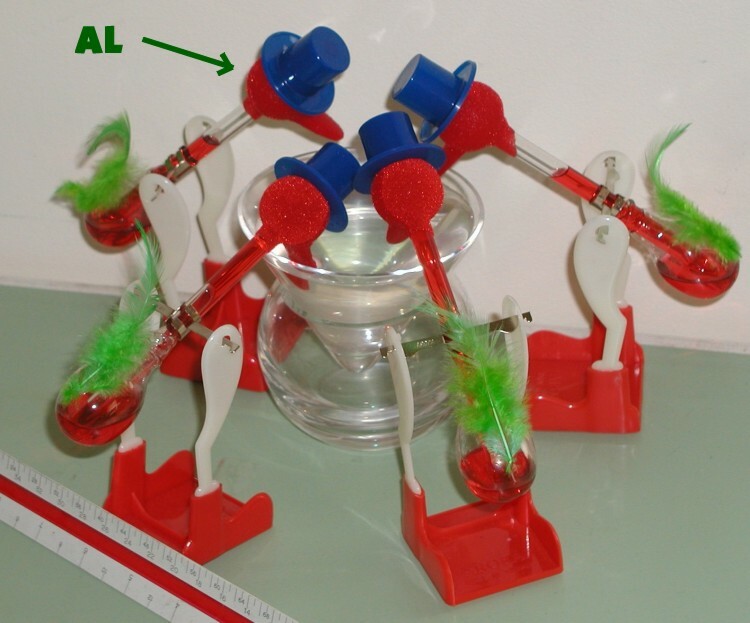 A reader sent in a url with cool RGM (Rube Goldberg Machine) video. In Britain, such a device would be called a Heath Robinson contraption, after the British cartoonist who also drew fantastic comic machinery, in his case tended by bespectacled men in overalls. In Denmark, they would be called Storm P maskiner after the Danish cartoonist Robert Storm Petersen. In Spain there is not a particular noun to mean such machines, but a reference akin to Goldberg's machines existed: Catalan cartoonist Jordi Sabatés made up and drew many of those devices for a section in the TBO magazine, allegedly designed by some Professor Franz from Copenhagen. The Norwegian cartoonist and storyteller Kjell Aukrust created a cartoon character named Reodor Felgen who constantly invented complex machinery. Though it was often built out of unlikely parts, it always performed very well. In Japan, they are called ピタゴラ装置 (pitagora souchi), which means Pythagorean Machine. Reader Mitchell Wand wrote in to describe this 10 minute film of Japanese Rube Goldberg machines which is available at http://www.pistolwimp.com/media/44210/ I think the it's on youtube and google video as well. It's good. Some people think the accompanying music is a little bit, I dunno, cloying but it didn't bother me. The Wall Street Journal ran an article earlier this week about the Pentagon's quest for smaller, precision guided munitions. Called the "small diameter bomb" this thing has a much smaller radius of lethality than previous big bombs. The problem with current smart bombs is that they're huge -- 2000 pounds of explosive or more. So, you can't take a house with it, only a neighborhood. So, smaller bombs are the new big thing in bomb making. Relative effectiveness factor (R.E. factor) is a measurement of an explosive's power for military demolitions purposes. It measures the detonating velocity relative to that of TNT, which has an R.E. factor of 1.00. 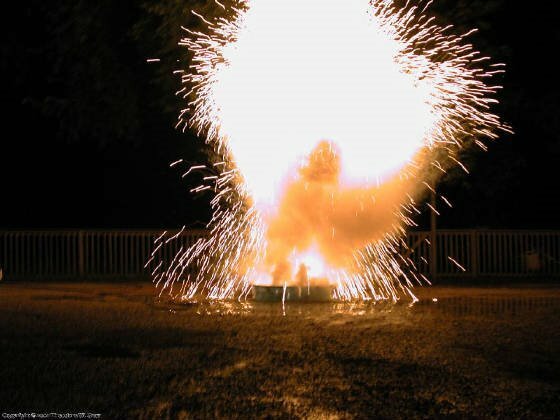 But the most powerful explosive is a University of Chicago developed one called Octanitrocubane. It's a shock-insensitive high explosive. The octanitrocubane molecule is really unique, shaped like a cube with nitro molecules hanging 90 degrees off each corner of the cube. When those bonds break, there's a ton of chemical energy released. It's RE factor is well over 2.0. 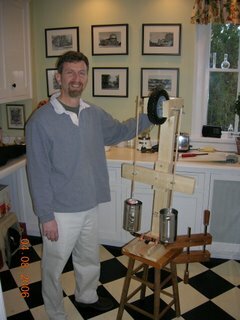 In an earlier post, I mentioned I needed to make a simple hot air engine, called a Stirling Engine, for a Make Magazine article. I called up the head of the hot air engine forum on Google to see if he had any advice. Since by coincidence he lived fairly close by me, we made arrangement to meet at his house. Lots of engine projects going on there. He's got a mill and lathe so he can do precise machining. One of his current projects is to build a couple of steam engines to power a boat. Cool project. Well, I spent all weekend on the project and finally got it to work late last night. I have no doubt that I made this a lot harder on myself than I needed to because I once I finished it, it really was pretty simple. Anyway my Stirling engine works and that's the important thing. Full and exhaustive details will be available in the Vol 7 (I think) of Make Magazine. A couple people commented on a previous post that Stirling engines are sort of a black hole of engineering time and money. Every few years, it gets "rediscovered" and companies try to find a practical use for it. So far, there hasn't been much application, but as energy prices increase the calculus and economics of what makes financial sense and what doesn't seems to change. Maybe there will some use for these in the near future. "Adventures from the Technology Underground" is an interesting read for everyone. Geeks like me will find it familiar, while non-geeks will get an interesting look into a different sort of world." The folks at Random House tell me the New York Post will review my book, Adventures from the Techology Underground this weekend. Check it out if you have access to the Post. There's also a review coming up in the next issue of Sci Fi magazine. The always interesting Norwood Matt sent along this, regarding a man in France who used a giant slingshot to hurl himself in the air and then parachute down to safety. Awesome video of the attempt here. He was successful. This is unlike the a previous human catapult attempt. A few years ago, a Bulgarian college student named Dino Yankov was catapulted out of a giant trebuchet somewhere in England. Unfortunately, something went wrong and he missed the net. 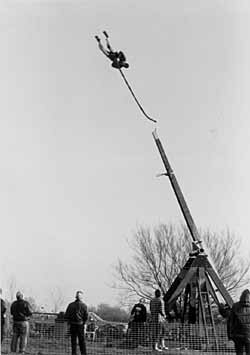 The trebuchet owners were charged with manslaughter by the English authorities. A good friend of mine, who is one of the world's best trebuchet builders and a professor of engineering at Virginia Military Academy worked on the case as an expert witness. Describing Mr Yankov's jump (the eyewitness) said: "At some stage I saw Dino as a ball in the air. He then missed the safety net, but I couldn't say by how much. "As he hit the ground I heard a thud and then a second thud." Paramedics rushed to the scene and Mr Yankov was taken to Bristol's Frenchay hospital where he later died. Explaining the safety procedure to the jury, he said that each jumper was initially weighed and placed into a weight category. The jumper was then weighed again while wearing safety equipment. The weights on the trebuchet are then changed to match the weight of the jumper and a test weight that corresponds to the jumper's weight is then fired to check for any problems. Last year, Mr Wicks and Mr Aitkenhead were acquitted of Mr Yankov's manslaughter after the trial collapsed at Bristol crown court. A series of pictures from more successful hurlings of humans by catapult are here. I must say, these are pretty cool pictures. I have not perused all of your blog, so don't know if you have noticed/mentioned this site. Suffice to say I'm glad THEY did it and video taped it rather than me (or my son). It makes one wonder when they are standing around this stuff while it's burning, breathing in some of the fumes and thinking aloud "I wonder what the smoke consists of? ", while various people (and children?) get in for a close look (while various smoke induced coughs are going on in the background). Also, I wonder if this pretty much debunks the myth of the kid that bought a brick of sodium, rowed out to sea, and was never found again after one large explosion. It seems that there should have been a number of (large) explosions as the brick shot itself back into the air. The only other thing I could surmise is that if the brick were to be dropped into the ocean unopened (I believe the story goes that it was wrapped in something like wax or wax paper), whereupon a hole is pricked open upon striking some corral or rock or whatever prickly ocean-bottom thing, creating a huge super-heated hydrogen bubble that created a massive single explosion upon entry into the more oxygen-rich atmosphere. But that's just a guess. Perhaps you could try it for your next book - "Fun with Sodium" or "Sodium Isn't Just For Food". The URL of the page he is referring to is here. It's a really good page and I couldn't help but laugh and cringe at the same time. Anyway, after reading that page, I thought to myself, "hell yes, a sodium party! That's the ticket! I could bring brick of the stuff to my brother's lake cabin and do some sodium based explosive fishing. So I went online to try and find solid sodium. I couldn't find any on Ebay, but Fisher Scientific sells scientific grade sodium. But it's nearly $300 a pound! That's a lot of dough to invest in a single good explosion, especially since commerical sodium goes for about $40 a pound. So the sodium party will have to wait. If anyone knows of good deals on solid sodium, lemme know. Stirling Engines - Hard to Make? I've been spending a great deal of time lately trying to build a model engine for an upcoming magazine article. To do so, I've had to re-read some old, old college textbooks. The great thing about mechanical engineering as opposed to say, electrical engineering, is that so a lot of what you learned in college goes stays relevant. For example, I had need to pull out my 30 year old thermodynamics text book and the stuff in it is still, while not cutting edge, correct and useful. Anyway, Stirlings are actually more efficient and emit much less pollution, and here's the big thing-- they run on anything that produces heat; from gasoline to hydrogen to cow dung to ethanol . 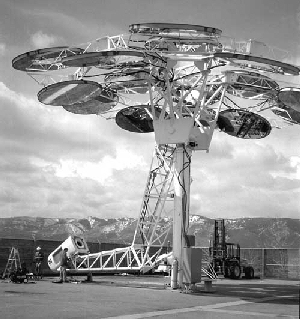 The picture above is of a solar powered Stirling developed at Scandia National Labs.There was some interest in automotive Stirlings back in the 70's when Ford and GM outfitted some midsize cars with them, but they never went anywhere. Now, I'm thinking that with hybrid technology, automakers could marry an electric motor to a Stirling, something like the way a Prius works. With a Stirling engine, we'd have a machine that doesn't pollute and is not dependant on foreign oil. That's all good. If any reader is familiar with no-machining Stirlings, I'd appreciate hearing from you! A huge mushroom cloud of dust is expected to rise over Nevada’s desert in June when the Pentagon plans to detonate a gigantic, 700-ton explosive – the biggest open-air chemical blast ever at the Nevada Test Site – as part of research into developing weapons that can destroy deeply buried military targets, officials said Thursday. The test will detonate 700 tons of heavy ammonium nitrate fuel oil emulsion – creating a blast equivalent to 593 tons of TNT – in a 36-foot-deep hole near a tunnel in the center of the Nevada Test Site, according to official reports. It aims to allow scientists to model the type of ground shock that will be created, and to weigh the effectiveness of such a weapon against its collateral impact. “To my knowledge, this will be the largest open-air chemical explosion that we’ve conducted,” said Darwin Morgan, spokesman for the Energy Department’s test site. While 600 tons of TNT doesn't sound like small potatoes, it isn't that large. It's big for the Nevada Test Site, but small compared to what goes on in New Mexico. I think they're using NTS because there's already a tunnel there that can simulate a bunker. So Divine Strake, the code name for this test, at 700 tons will the largest carried out in 15 years.